The perfect design for ocean lovers world wide. 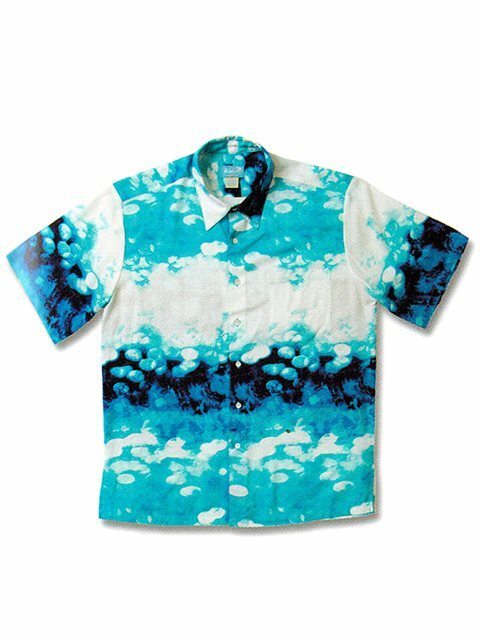 Kai Ocean Celebration is made in Hawai`i from a luxuriously soft,100% imported rayon dobby and constructed so the print is seamless through the center and pocket. Each shirt is adorned with natural trocas shell buttons etched with the Kai logo. The combination of navy, royal, and aqua blue as they mingle with white create a uniquely fun yet striking image of the ocean. Love this shirt! Bought the teal version for my son years ago, perfect for the Jimmy Buffett concert. This one is for ME. I'll wear it loose over a white tank. Please make a ladie's T-shirt in this pattern!